Our answer? A vision, actually. The Lord spoke specifically to me last year with a vision of young adults from across the country representing all different churches and uniting together under the single banner of “JESUS” to spread love in an unfamiliar place. Over the course of the past few year, that vision has been confirmed in many ways and molded into a pretty exciting 15-person adventure to an Apache Indian Reservation in Whiteriver, Arizona! We’ve been inviting like-minded young adults from across the country to join us on a mission trip JULY 6 - 13, 2013. While in AZ, we’ll be partnering with Adventures in Missions (an organization that has taken over 10,000 students/adults on mission projects in the last two years). They will handle all of the logistics for us. Based on the skillset and passions of our Team, AIM is getting us connected with two local ministries that are already running in Whiteriver: Apache Youth Ministries and Little Blue Bird Studios. As a Team, we’ll be spending time with little kids on the Reservation, mentoring students, pouring into other young adults who are leading those ministries, teaching life skills and creative arts business skills to students / young adults that will help enable them to break the cycles of poverty and dependance on government aid. There may be other needs in the community while we are there as well. Missions are a unique chance for us to put what Jesus teaches into practice. Because of our Team’s obedience to God’s specific call, we’re certain He’s going to show up in a big way! We can’t wait to see His plan unfold—around us, but also in our hearts. 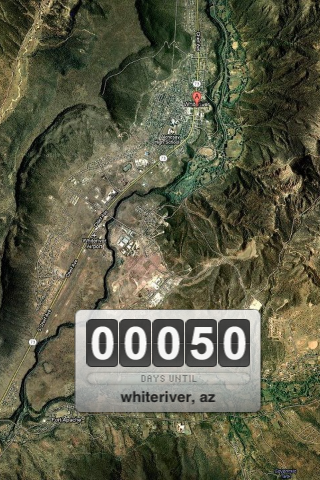 As you can see from the picture, we are 50 days out from fulfilling the vision that God called us to back in 2011. The excitement within the team is building and wed love your help as we step out in obedience. By praying for us as we prepare and go to AZ, you will have a direct impact on our ministry. Prayer is of vital importance to every aspect of life and this project is no exception. Also, the cost of the project is $450 per person + the cost of flights to get to Pheonix (which, at this point are upwards of $370 depending on the starting location). We’re raising funds as a Team, but Amber and I are personally committing to save and raise as much as we can over the next few months to cover our own costs and contribute to the Team total. Will you consider supporting us financially? We just need at least 25 people to give around $35 each. If you’re interested, please visit our secure, online support page at http://bit.ly/AZmission2013. We hope to raise all of our funds by July 1st. Your faithful prayers mean a great deal to us—we truly appreciate your support and will keep you posted with details on our support page. Thank you for sharing in this opportunity with us to influence the lives of many people, not just in AZ, but also in our own lives and the lives of our Team.